Cookies for breakfast, say what?! YUP. First off, I am a total cookie girl. There is (almost) nothing better than the smell of fresh baked cookies coming from the oven! I said almost because there is nothing better than fresh Cinnamon Rolls baking in the oven.. Second off, overripe bananas don’t get the appreciation they deserve. They are so versatile it’s hard to go wrong with a cookie for breakfast. These also make a great snack or even dessert when you get a sweet craving (try them warmed with peanut butter spread on top–you’re welcome). These cookies are sweet and chewy and packed with healthy wholesome ingredients. Since overripe bananas tend to be naturally sweet, there is very little sugar in this recipe. The only sweeteners I used was pure maple syrup, honey and a pinch of brown sugar! 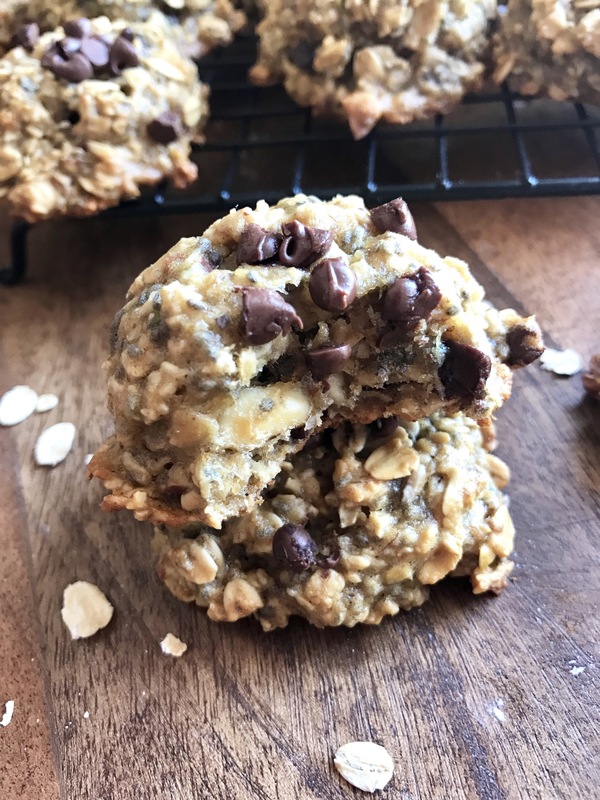 Start your morning with these healthy, sweet and chewy breakfast cookies! Preheat oven to 350 degrees. Mash the bananas with a fork until it looks like a banana puree. Stir in the honey, maple syrup, brown sugar, vanilla extract, egg, baking powder and baking soda until well combined. Fold in the oats, nuts, chia seeds, flour and chocolate chips. The “dough” will be slightly thinner than a typical cookie dough. With a spoon or mini ice-cream scooper, scoop cookie dough onto a baking sheet lined with parchment paper. Sprinkle a few more chocolate chips to your cookie and lightly flatten with your hand (the cookies will not spread too much). Bake for 12-15 minutes. Let cool and enjoy! It is also a really great feeling to know these cookies are healthy and nutrient packed. Make sure to not let your overripe bananas go to waste again! If you are not in the mood for chocolate, swap the chocolate chips for dried cranberries or cherries! 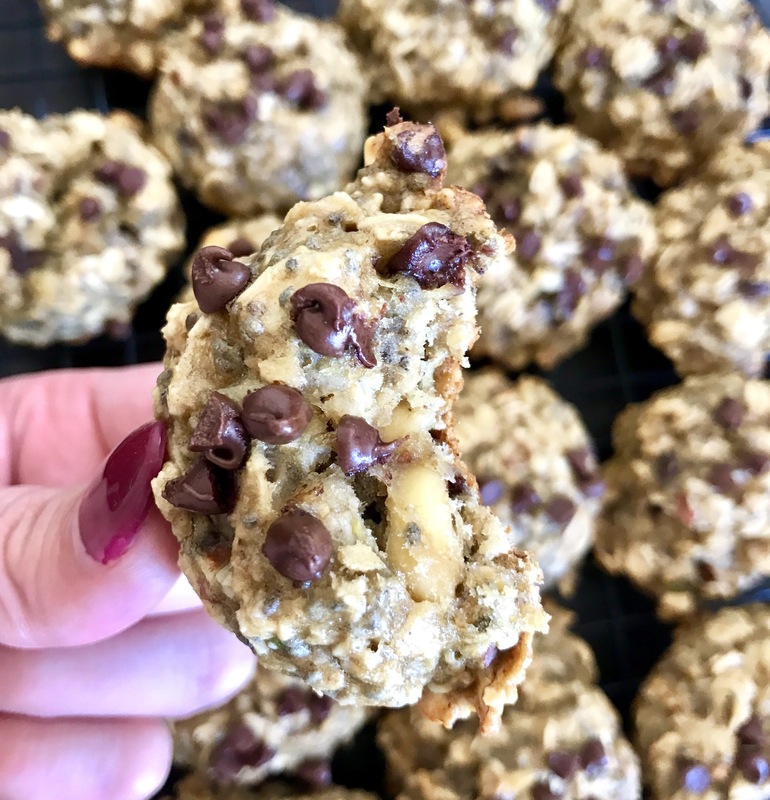 These will make these cookies extra chewy and extra fiber-packed!